Well, after a lengthy pause, I'm able to renew postings on the Gilpin Tram modeling thread. 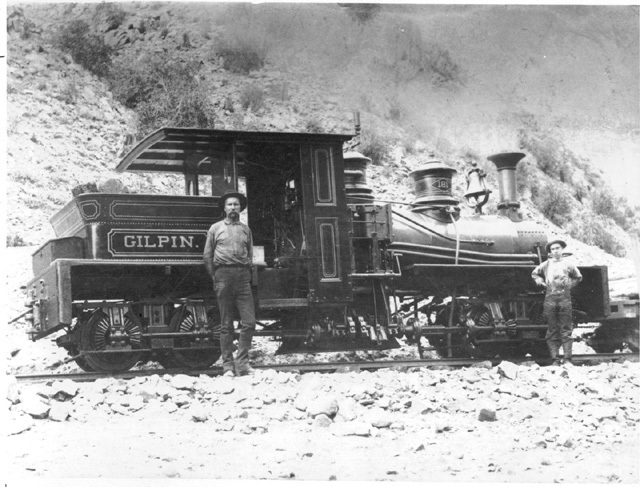 If you were following the previous thread, "[/url][url=http://freerails.com/view_topic.php?id=4599&forum_id=17]Modeling The Gilpin Tram (part I)" , we made it to the 945th post! However, due to dust storms on Mars, hacking by the Russian Government, or some other mystifying cause, we need to start this new thread. Postings might look slightly different, due to some FreeRails software changes, but the topics, modeling, sharing of ideas, and fun will continue. Well, last Tuesday was a bittersweet day. I got what will be my last UPS package of stuff shipped to me from Caboose Hobbies in Denver, Colorado. 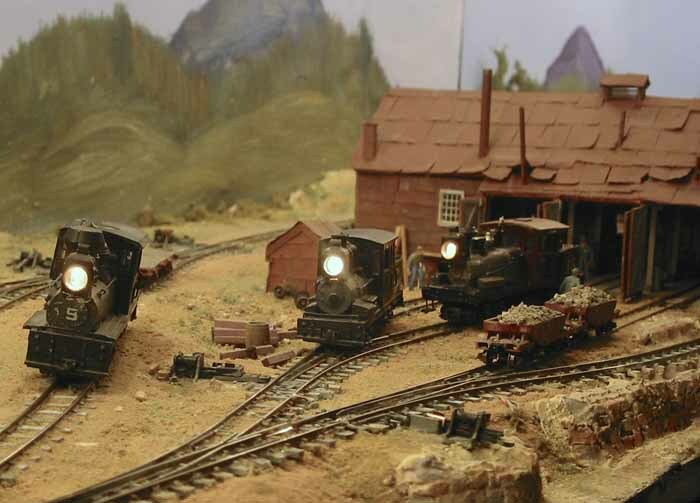 Every time I visited Denver, a must stop was at Caboose Hobbies, which was a huge hobby shop loaded with models, kits, and parts, and that included a lot of narrow gauge modeling items and narrow-gauge-themed books, too. However, the store's landlord made them move for a site redevelopment, and it was time for the owners to retire, and so they are closing up shop this month. This isn't the first wonderful hobby shop to close or migrate to web-only, and won't be the last. All things change in this world, and I suppose this hobby isn't exempt, either. However, on the plus side, I got a neat book shipped to me, and a bunch of locomotive and car parts that I can use for modelbuilding on my Gilpin Tram layout. So, there will be more to come! The 'Gallery' function should be available to you now. Have you checked the current recommendations in the 'Read This' Forum TECH. HELP ? Mac/Safari I don't think will show 'G' in the Posting-window. But I believe most other hardware/software combinations should. Well, thanks to help from Si, Herb and Eddie, my previous difficulties with the Freerails software have been worked out. So, let's get back to looking at the Gilpin Tram. 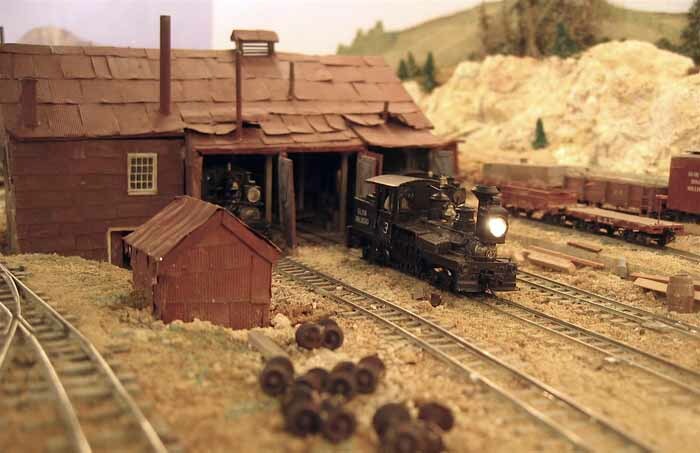 In my previous posts, I started posting about my next big modeling venture, modeling the enginehouse, yards, mills and buildings of Black Hawk. 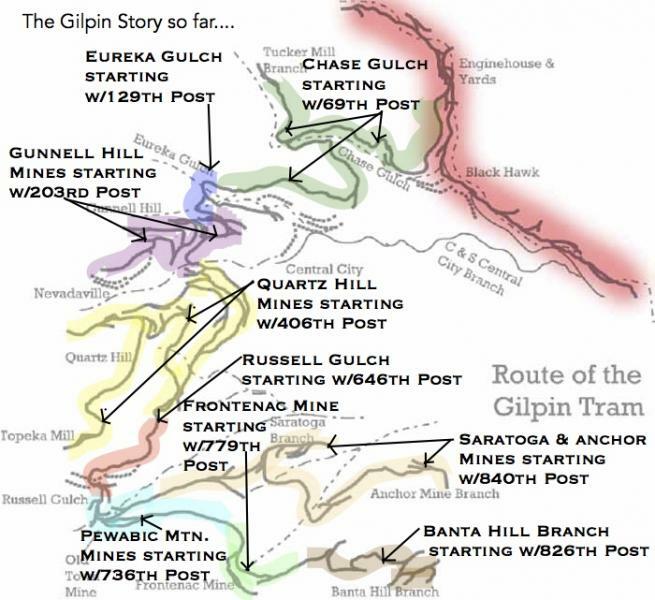 So, if you're if your seeking more information about the Gilpin Tram, don't forget to check out the Part I thread. 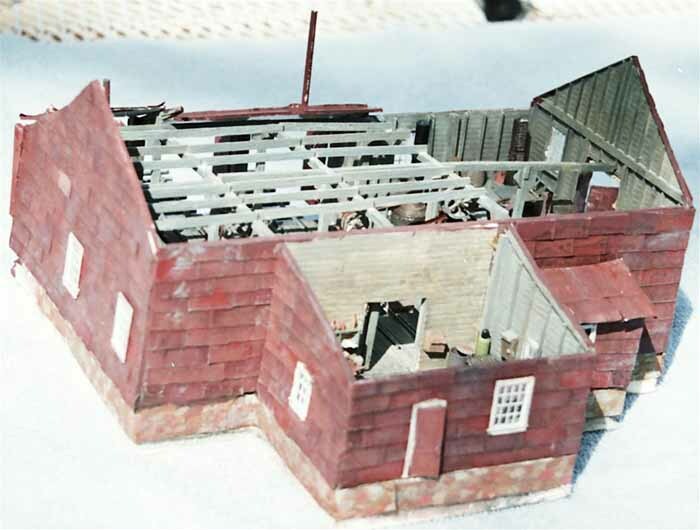 I first built an HO model of the enginehouse in 1993, and this was eventually written up in an article in the September 1999 Gazette. This model was of the final three-stall version, and included a fully detailed interior. At the time, I was building a small 4' x 9' layout, and set out to reproduce as much of the Gilpin Tram's enginehouse area as a I could. 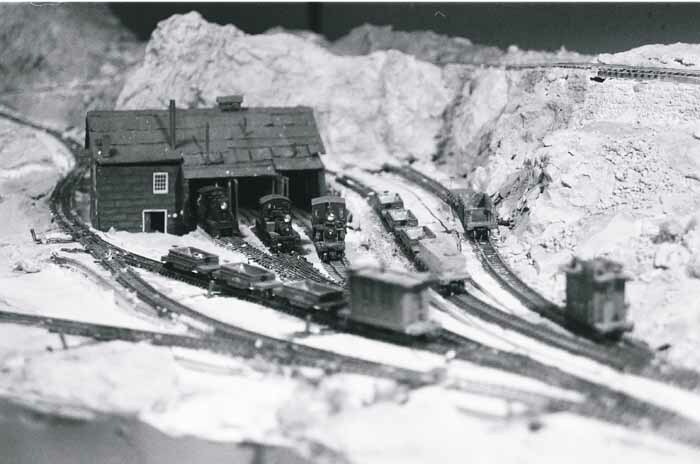 This shows a 1993 view, and eventually, the area immediately around the enginehouse was scenicked, but the rest of the layout was never completed. After the previous layout was torn up, I began building a two-level layout based on the Gilpin Tram (again, in HOn30) in a larger space in my basement. So, the enginehouse model was reused on the new layout. I didn't have quite the space I needed to model the real Gilpin Tram's trackage accurately, so I compromised. In the view above, you can see I included a wye right next to the enginehouse, and I built a small (non-prototypical) yard off to the side. Then, I dismantled two-level layout, so my son could use the area for his musical efforts. I then started building a shelf layout around two walls of the main basement rec room. Again, I had to compromise the track layout, but this layout was built for operation, so I included the trackage I needed - a small yard, two mill tracks, interchange, and a boiler works. I didn't have room for a wye, so I put a very unprototypical turntable behind the enginehouse. Then, I moved, so I restarted my HOn30 layout. Once again, I did not faithfully model the Black Hawk trackage, but fit in the enginehouse where I had space. Once again, I didn't have space for a wye, so I put in a turntable (the real Gilpin Tram never had a turntable). But, after 7 years, we decided to move once again, so, this layout was dismantled and parts of it saved. But, by then, Mike Pyne of Wild West Scale Model Builders expressed an interest in bringing out the enginehouse as a kit. Since the enginehouse (temporarily) did not have a layout space, I gave the enginehouse to Mike to use as an example. So, when I do build my new model of Black Hawk, I will either build a kit, if available at that time, or scratchbuild another one! Keith, wonderful views of "engine house transformation". I have wanted to build the house for many years but your model was so nice that what I could build would be a travesty. Finally Duane brought out his SC book and I found another engine house to build. The idea that Gilpin's house was an old barn is just great! A barn for iron horses. Thanks for the nice comments about the enginehouse model. However, it was your Mogollon Railway thread on Freerails that was an inspiration to me. I like the scenes you created, on a realistic, operating layout. I was trying to attain something similar. 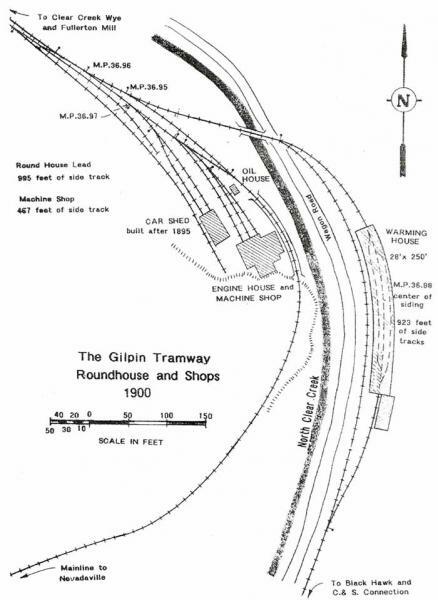 The Gilpin Tramway's enginehouse and yard area was simple and compact. This was something worth modeling! The map above, sketched from the original Sanborn Fire Insurance map from about 1895, shows the former barn-turned enginehouse built between Clear Creek and against a steep mountainside. 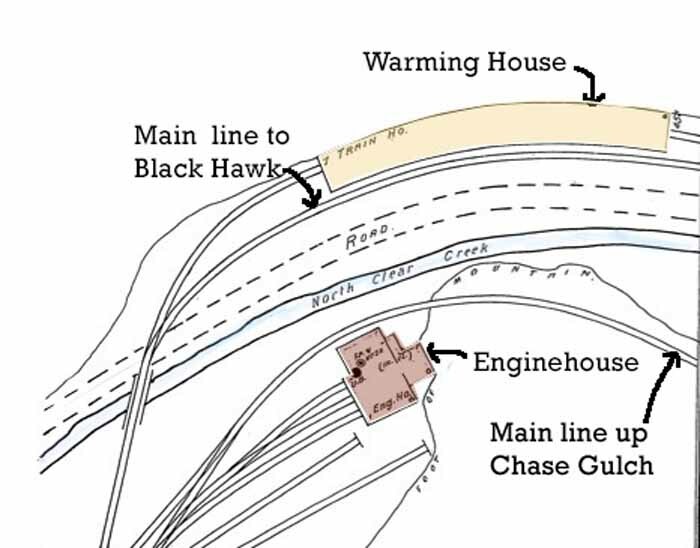 This shows my model railroad trackplan for Black Hawk as it existed until 2005. This was part of an article originally published in Railroad Model Craftsman in September 2003. I had room to model Black Hawk in HOn30 on a shelf area 16" x 96" - very tiny. But, I did have room to model the trackage to the main items of interest. The enginehouse was the main focus of the scene, and the rest intended to be mostly building flats. 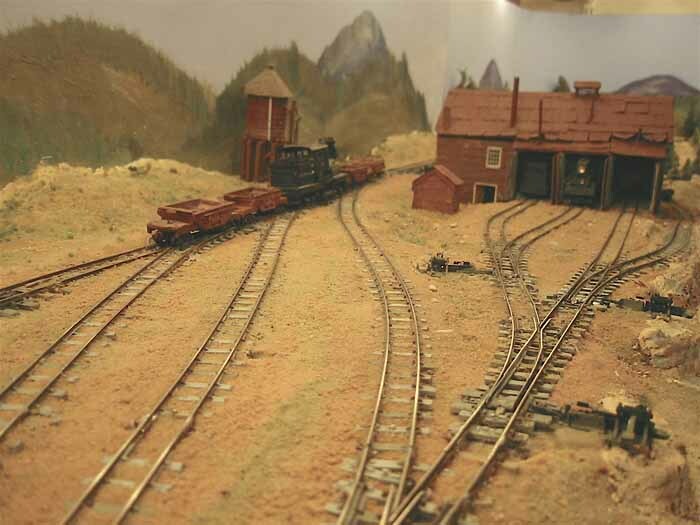 This is an overall view of the Black Hawk portion of the layout. This is a very compact scene - 16" x 8' long. 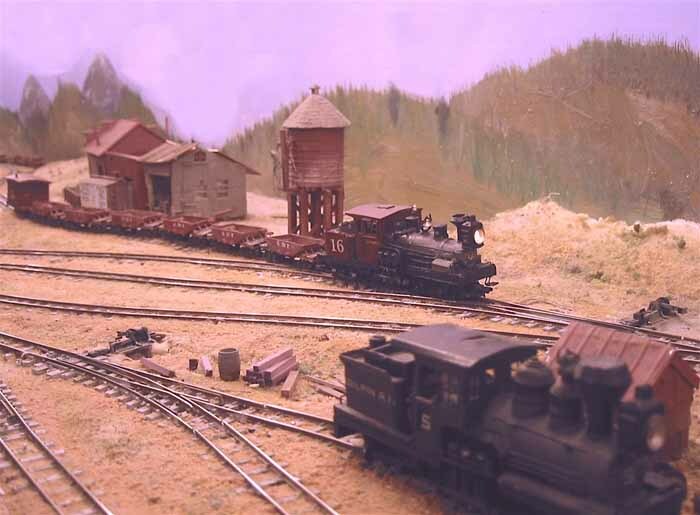 You'll also notice some non-Gilpin rolling stock in the picture - a caboose with cupola, and two boxcars. I wanted to model traffic for non-ore freight, that would be in bboxcars, tankcars, and other rolling stock. I want to model this on the current layout I am building, too. For this layout, I used Peco Hon30 (009, actually) turnouts and flex track. It worked rather well, and I'll probably continue to use the same track on the new layout. Since this photo was taken, a lot more HOn30 locomotives have become available, and these will find a home on the new layout, too. The three locos shown here were all scratchbuilt bodies over N scale mechanisms, with dummy, non-operating cylinders and jackshafts. On these small models, the non-operable parts were not all that noticeable. However, now I have been using N scale shays with scratchbuilt bodies, and these look much better. 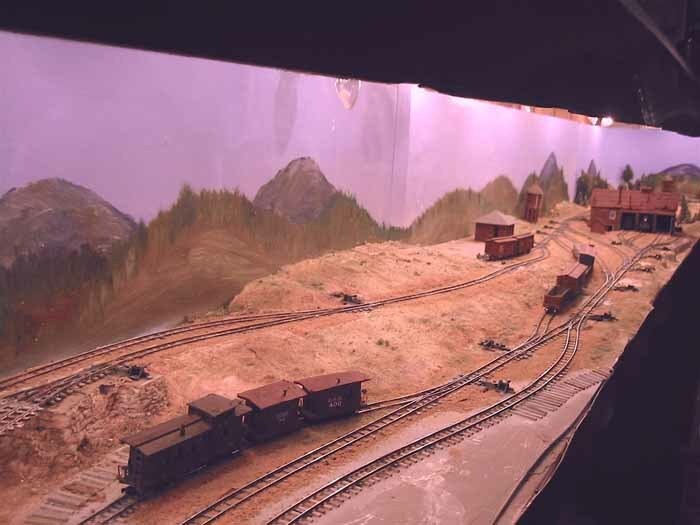 Looking back at the former, pre-2005 layout, this photo was taken during one of many operating sessions. I learned on this layout that a small amount trackage, but laid out in plausible configuration, was interesting and fun to operate. 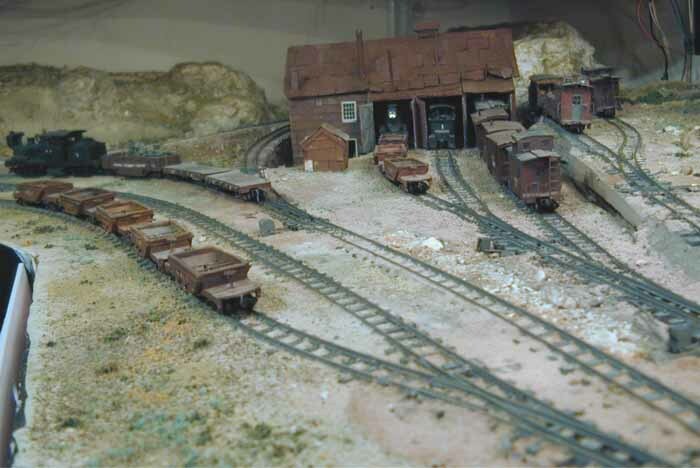 In this photo, a train of empty ore cars is headed to the mines. I set out some structures as mockups, but never finish the scenery on this part of the layout, due to an impending house move. 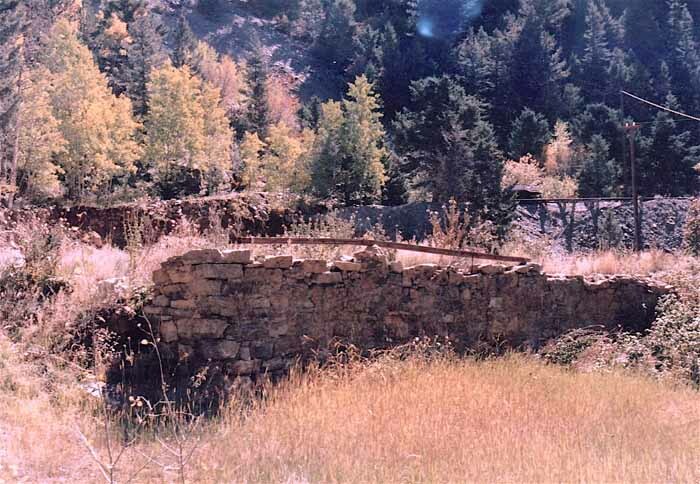 Across Clear Creek from the enginehouse, the Gilpin Tram built a stone warming house. This structure was need to provide a place for loaded ore cars to be parked and warmed until the ore loads thawed. The gold-bearing ores tended to be mined in wet conditions, so during winter months, the ore often froze up. 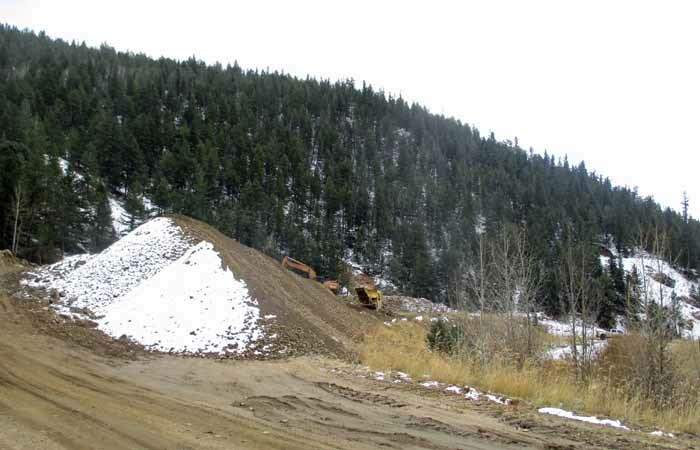 By parking the loaded ore cars overnight, or for several hours in a heated structure, the loads would thaw, and then be taken to the various mills to be dumped into the ore bins. This map was drawn by Dan Abbott, and originally published in Issue 4 of the Gilpin Railroad Historical Society Newsletter. A similar map of Dan's was also published on page 33 of the book, The Gilpin Railroad Era. 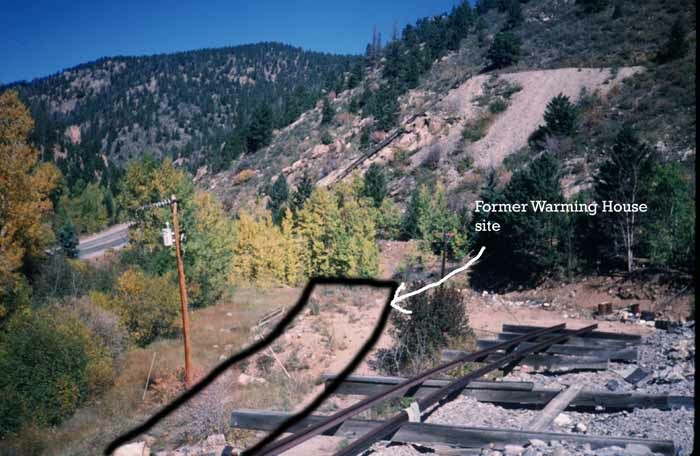 Dan's research shows the mainline down into Black Hawk passing by the stone structure, next to the creek. Dan's research showed the building eventually measured 28' wide by 250' long. I think this structure was modified quite a bit over the years. Originally, the building was heated by a series of stoves, but later, a large boiler was set up, and fed steam pipes throughout the building. I think the small structure addition on the south end is the boiler house. 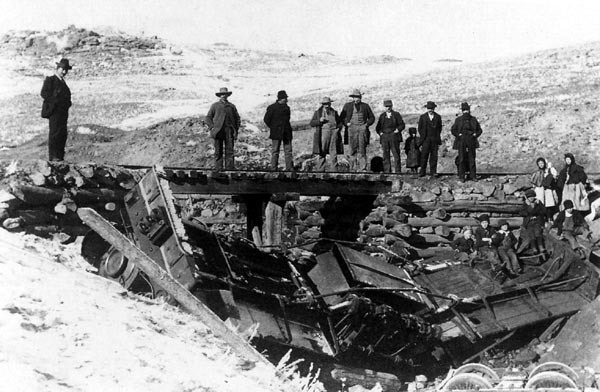 This structure was located on a sloping grade, so the loaded ore cars would be dropped by gravity onto the tracks. The building was too low for locomotives to go inside. Parts of the warming house survived into the 1980s. By the time I first saw the area, in 1986, only a part of the stone walls at the north end were still standing. 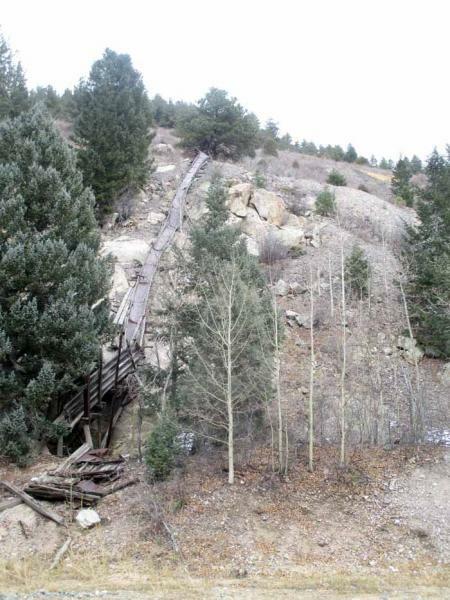 The rest of the structure had been torn down or covered with waste rock from mining operations. Due to "progress", the large amount of new development in Black Hawk and Central City caused a lot of changes. One casualty was the warming house ruins. The walls were knocked down, and the site covered with soil and gravel, and construction equipment parked on the site. Today, the site is vacant, and nothing remains. It is a real shame that traces of the GT are being desecrated for the "good" of gambling and "progress". When I lived in Denver, I used to really enjoy getting to Blackhawk & Central, it made living in Denver more tolerable!